This Sunday is next edition one of our favourite event in capitol. DIY Cultures fair is back for its 5th year on Sunday 14th May to takeover all 4 floors of Rich Mix. 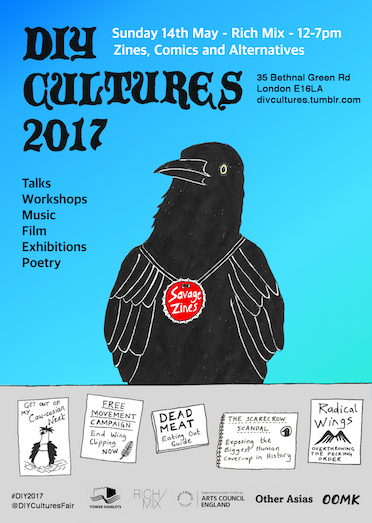 DIY Cultures is an annual day festival exploring intersections of art and activism, running since 2013. The programme consists of a zine fair, exhibitions, workshops, contemporary craft, panel discussions, comic illustration, video art and digital animation exploring DIY practice. The event has established itself as a leading national forum for artists-run initiatives and alternative publishing. The event distinguishes itself by by its commitment to Black and people of colour empowerment and centralising marginalised histories and subcultures such as neurodiversity, diaspora stories, prisoner solidarity, radical mental health and Muslim communities under the War on terror. This year’s event is bigger than ever with more than 90 stalls showcasing the best in independent publishing and stands as Rich Mix’s most-attended event of the year. The festival extends to a 4 week exhibition DIY Knowledge running from 3rd May until 2nd June in Lower Cafe Gallery. The curators have commissioned outdoor art, interactive animation and architectural collective Involve to make a communal table.